A classic that never goes out of style: featured on vernerpanton.com. Part of the collection of the Museum of Modern Art, New York. 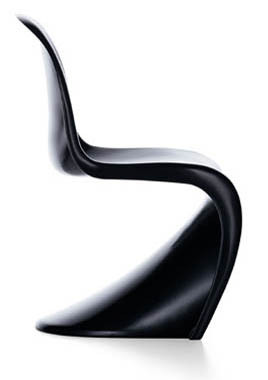 The Panton Chair is a furniture design classic. Verner Panton created it back in 1960, and with the assistance of Vitra developed a version ready for series production (1967). It was the very first fully plastic chair made from a single section. Since its market launch, the Panton Chair has undergone several production phases. Not until today was it possible to produce it in line with Panton's original idea - namely from consistently dyed, tough plastic with a matt surface. The chair offers great seating comfort thanks to the cantilever base, together with its shape - designed to do justice to the human body - and flexible materials. It can be used on its own or in groups, in rooms and even outdoors.